We’re lucky to have a chance to learn from mistakes of others, and lucky to have someone willing to share their experience. Today our guest is Patrick Gerrits, a former owner of the best rated e-commerce store in the Netherlands, who has graciously agreed to tell a story of his striking success and bitter failure. 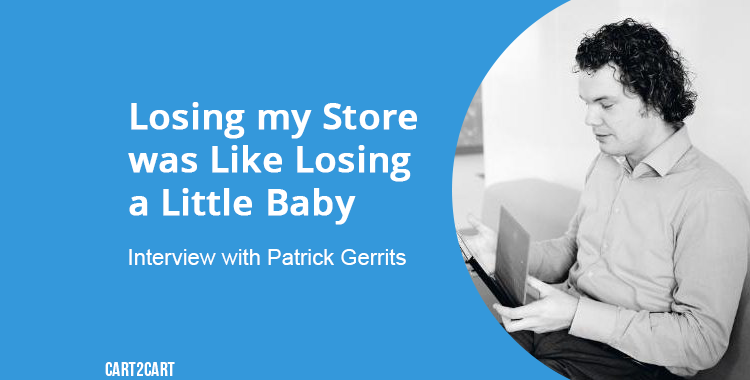 Currently developing e-Commerce courses for other entrepreneurs, Patrick speaks on the importance of customer service, and why you shouldn’t start a business with money in mind. Please, enjoy! Q: So, Patrick, how did your first sale took place? The first sale we had on our first online store was a from a customer that we did not know, we did not know where he came from. He ordered a computer game, and the next sale took us a week. Q: On your Udemy profile you write that after having an amazing success (over 1 million sales in the first year! ), your e-store got completely bankrupt at one point. How did that feel? And, what’s more important, why did that happen? That felt awful. It’s not only that you’re losing your little baby (my stores) but I spend a lot of energy on that business. Good thing was that we saw the bankruptcy coming. We filed for bankruptcy by ourselves so that made it a little more comforting. The reason why it happened is actually a fairly complex chain of events that happened. But the main reason was cash flow problems. It all started with the fact that we were waiting on a bigger company credit from the bank. In the meantime our business was growing and we had around €100.000 of products in stock. The credit we had at that point was €50.000. The bank insured us we could get €250.000 without any problem. But then the Euro crisis struck Europe. Banks became in confident, the rules changed and we did not get a raise of credit. Nothing to worry, but then the bills starting rolling in forcing us to pay €90.000 for 1 shipment. That money was invested in stock... So we had a problem. We dumped all our products on the market to make quick cash to pay the bills. And then you start paying one credit with the other credit and bankruptcy came quickly. Funny thing is that we only needed €30.000 - €50.000 from an investor or bank and the company was saved. Q: What is the best strategy for starting an e-Commerce business? What comes first? I really think there is no best strategy for starting a business. Some people start with nothing but a great idea and some people start with a big investor and an average idea and they could be both successful. Thing is that it is very important how you run the business. Customer Service breaks or creates your success. It is the only human contact customers have with your store, make it a good one. What made us successful in a short period was on one side, the right product for the right price on the right place but secondly that we started a business for fun, and experience and not for profit. Because that thirst for profit steers you to bad short term decisions. Q: It’s said you’re an IT Architect at Oracle. What are your responsibilities there? Does this mean you said goodbye to e-Commerce? Actually I’m just an IT Architect working with Oracle software. I create new landscapes or solutions for customers and help them become successful with Oracle software. This is my normal day job, after the bankruptcy my wife thought it would be nice to have some money to do the groceries, so is started working a normal day job again. Currently, after spending time with my family and two kids, I’m currently working on building courses on Udemy, and creating a tool that really could help ecommerce businesses become better. During my time as an entrepreneur we had to face many discomforts, one of them was that there are really good software packages out there, but there are incredibly expensive and only in reach for multimillion dollar companies. My start-up is creating a one stop solution for that. Q: There’s an opinion that “Do what you love” is a terrible advice, especially when it comes to operating a business. What’s your opinion, Partick? I did what i loved, and after stopping my work at the business i think about that time every day. I’m an entrepreneur not an employee. The real essence is that you are running a business and you are selling products or services to customers. You cannot run the business from your perspective and only sell the things you would like or love, because other people want different things. And sometimes you need to make hard decisions, like letting someone go, or stopping an activity because the company is losing money. Q: Many of our blog readers are considering leaving their current e-Commerce platforms and moving elsewhere. How you ever experienced shopping cart migration? And what’s your favorite platform? Personally i think you can maybe change once. It has a very high impact on your customers, because it has an impact on your processes. Emails look different, the account menu looks different and you work different with the software and you customers notice that. Besides that you have the data migration issues, the new learning curve, that one plugin that was availed in platform X but not in platform Y. At the moment I run some small shops, one is in WooCommerce, two in Opencart and one in Magento. They all have their pro’s and con’s. I like WooCommerce because of the small learning curve and the possibility for eating a good looking shop. Opencart is great when you have a lot of products but still want the easy customizations options. And Magento for the pro stores. Q: Patrick, what’s your thought on implementing “Buy Buttons” on social media? Facebook, Twitter, Pinterest and Instagram are testing the possibility of purchasing and selling directly through their platforms. Will it change the way e-Commerce works? No. Because e-Commerce is psychology and the psychology of humans does not change. Yes maybe the end results changes, but the way our brain works and how it makes decisions will never change. Besides that I think that social media is great for extra (please take note of the word ‘extra’) customer service. And communicating with your loyal fans and customers. But not so great for selling products, and if it does work, it is not suitable for companies like us, it is for the big players, the Apples and Amazons of this world. They will profit the most. Q: OK, now the main question. How to create 1 million sales in a year? If that is your goal, then you should not start your business. Really. Because we were very lucky and took advantage of that luck. And there is the main point of success. Find that one thing that makes you different from the competitors and exploit that advantage. Work it every day! And I think I mentioned it earlier, but the second thing was customer service. At one point we were the best rated e-commerce store in the Netherlands. With an average of 9.8/10 on 900 votes. No one left our shop with a problem. If someone mailed us with a issue, we fixed it no matter if it costed us the profit for that customer. And, we always addressed all of our customers formally. If they were shouting at us, we stayed calm and address them formally. Those two things combined made us the only shop you ever needed to go to for an console or computer game in the Netherlands. Because we were always the cheapest, we had the stock, and the best rating of them all. And by the way, it was 1.3 million. Cart2Cart team would like to thank Patrick Gerrits for such an inspirational interview and wish good luck to him and all our readers. If you’re interested in mastering your e-Commerce skills with WooCommerce, feel free to visit Patrick’s Udemy profile for comprehensive courses on a subject. Stay tuned to our blog to catch more useful articles and curious insights on e-Commerce.